The samt applies to shopping, at least in a Swedish context. Everyone knows about Knalleland and all the strong brands that have headquarters in the city. 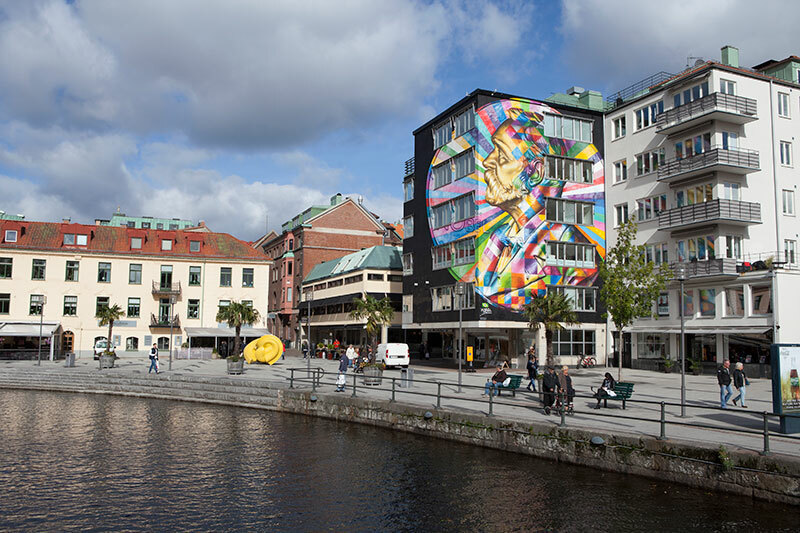 If you mention Borås to anybody with an interest in art, they will soon rave about the city´s fantastic art, sculptures and street art. But whatever you do, don´t tell a football fan you´ve been to Borås. He or she weill probably mutter that it was luck when Elfsborg beat his favourite team. Luck or not, Borås is simply a city with a lot of gumption. We are building like never before. Cafés and restaurants are popping up on every street-corner, not to mention one of the best zoos in Sweden, indoor and outdoor pools in the middle of the city and a beautiful countryside within easy reach. Borås is sometimes called knallecity. Knallar was pedlars, who, already in the 16th century, travelled by foot from door to door, selling handicrafts and textiles. They were a welcome part of people´s everyday life, not only because of the merchandise they offered, but also because the brought news. The pedlars also had a secret langugage called "månsing". However, it was not until the middle of the 19th century that Borås, founded in 1621, really started to develop a textile industry. Soon, there were textile industries and cotton factories in every neighbourhood. This was a trend which developed, over time, in combination with trade. Nearly all Swedish mail order companies are or have been located in Borås. In percentage terms, the region actually has a larger foreign trade than Hong Kong.